Seeing an increasing need for safe and effective surgical treatments to rejuvenate the appearance and restore youth and beauty, Dr. Wolf has offered safe and effective surgical and non-surgical procedures in West Alexandria, Ohio, since 1989. Dr. Wolf’s Rejuvenation Center for Face Lifts, Liposuction and Vein Therapy is a highly respected, state-of-the-art medical facility. 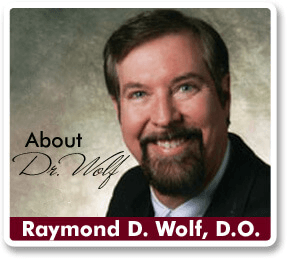 Raymond D. Wolf, D.O. is a 1986 graduate of New Jersey School of Osteopathic Medicine. During his first year, he received the McCaughlin Scholarship for excellence in Osteopathic Medicine. He also received the Dean’s Award for outstanding achievement when he graduated first in his class. He continued his training at Grandview Hospital and Medical Center in Dayton, Ohio. Board certification through AOBFP (American Osteopathic Board of Family Physicians) was achieved in 1995. He received Fellow status in the American Society for Laser Medicine and Surgery in 1997. Membership in the American College of Cosmetic Surgery and American College of Phlebology were also achieved. A Facial Surgery Preceptorship was taken with James Fulton, M.D. – the co-inventor of Retin-A. Liposculpture training was with Jeffrey Klein, M.D. – the originator of tumescent liposuction. Dr. Wolf also received personal training from other leaders in cosmetic surgery and phlebology and brought these advances back to Ohio.